Alex Automotive is a sales partner of Southeast Electric Cars. All of our vehicles are serviced & must meet our exacting standards. 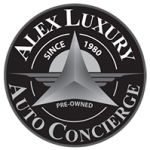 We also offer location services to help you find that Pre-Owned luxury car of your dreams. Contact us today and let us know what type of vehicle you’re looking for. Please feel free to visit our car sales site by clicking here.